A small island! Made of rocks! But still wonderful! A brilliant pebble in Saronic Gulf opposite the southeastern coast of Argolis in the Peloponnese! Small, but with a great history! Anchored to the sea and seamanship! Even if you do not know it, you feel it as the ship enters the harbor and you see the island settlement stretched on the slopes, with the houses climbing up one next to another. A painting! Traditional and cosmopolitan! A favorite island of artists, an international tourist destination for many years! Quiet during the day, full of motion at night! But without cars! Getting around only on foot, on donkeys, or by sea! 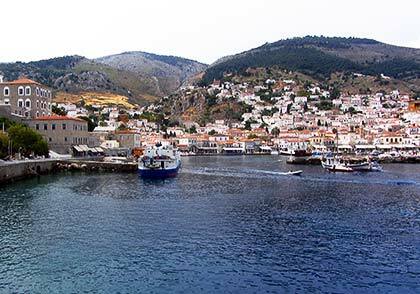 Hydra is located in Myrtoon Sea, off the coast of Ermionida in the southeastern part of the Peloponnese. It has an area of ​​50 sq km, a length of 20 km and a width of 5 km. The terrain is rough. Across the island a low mountain range is formed. Three peaks are over 500 m. Highest is Eros at 588m. 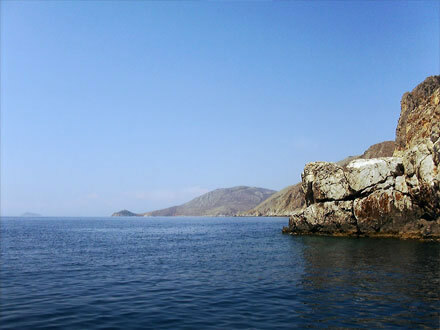 The coastline has a length of 56 km; is rocky with few bays. 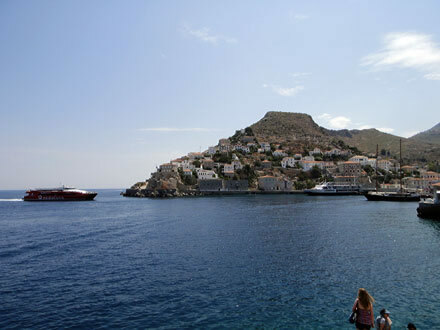 In the middle of the northern coast is the settlement of Hydra and harbor of the island. There are also some small settlements. The permanent residents are about 2,400 and nearly all live in the town. 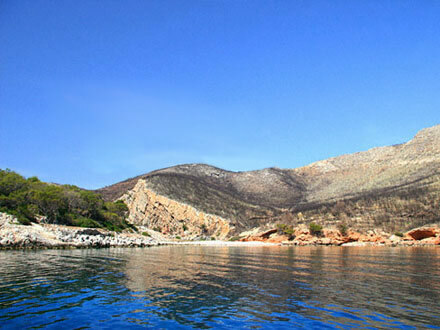 Near Hydra are the island of Dokos and several small islands and rocky islets. 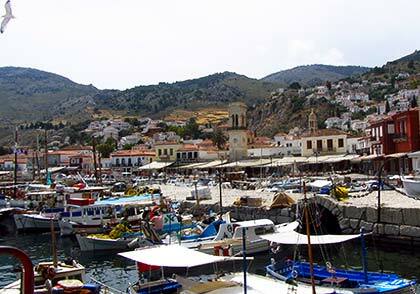 Dokos is located between the southeastern coast of Ermionida of the Peloponnese and the southwestern edge of Hydra. Its shape is long and narrow and has an area of ​​12 sq km, a length of 7 km and a width of 3 km. The highest peak is at 288 meters. The coasts are high and steep and have a length of 31 km. The islet of Petassi, the largest of the small islands, has a length of 1,300 m and a width of 500 m. There are also Alexandros, Aghios Nicholaos or Tsigri, Pontikonissi or Pontikos, Kivotos and the rocky islets of Palamidas, Vlycho and Kamini. Hydra is connected to Piraeus with regular daily service flying dolphins. The trip takes about an hour and a half. 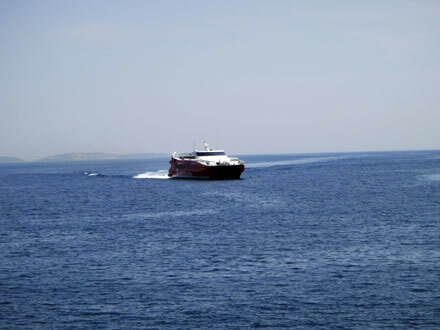 By the same route connected with Spetses and Porto Heli. We can also go by car to Metochi settlement on the southeastern coast of the Argolid and pass in Hydra by sea taxi (Information 22980 53690). No cars allowed; getting around on foot and on donkeys. Boats connect the port to the beaches of the island. Hydra combines the cosmopolitan ambience with the maintenance of the traditional character, with main feature the unique architecture, adapted to the natural environment. There are hotels, hostels, apartments and rooms. Most are housed in restored traditional mansions and houses. In summer the nightlife is intense; bars, clubs and evening walks. During the day, the time is dedicated to the sea; swimming and sun, windsurfing, diving and fishing. For walkers there are nice paths leading to monasteries, hills and beaches. 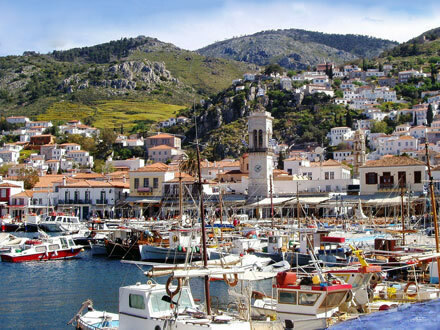 According to one aspect, Hydra was inhabited since the Mycenaean era. But the rough ground was the cause to remain almost deserted for centuries. In the antiquity it was called Hydrea, perhaps because it had a lot of water. The name is first mentioned by Herodotus, explaining that political refugees from Samos bought the island from the Ermioneans on the opposite coast of the Peloponnese. In 525 BC the Samians ceded to Troezen. During the medieval era was uninhabited and like many other small islands base for pirates. In travel documents and maps of the time name appears with several variations - Sidra, Sidre, Sidera and others. The first settlers came after the mid-15th century from the Peloponnese. The riots in the next three centuries brought new settlers from various parts of Greece and Asia Minor for greater security. 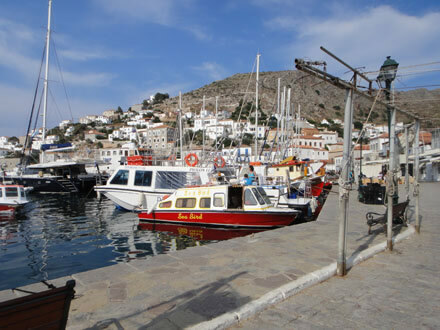 From the mid-17th century, the settlement of Hydra began to be formed and the conditions for the development of shipping to be generated, as the first ships began to be built, small sailboats known as trehantiria. From the mid-18th century began the construction of large ships traveling in the Mediterranean and the Black Sea, while the population increased by installing new settlers from the Peloponnese. International developments in the late 18th and early 19th century led to the Greek shipping flourishing and several islands acquired a strong fleet and wealth. The islanders made use of the privileges established by the Treaty of Küçük Kainardji, which ended the war in Russia and Turkey (1768-1774). A little later during the Napoleonic wars broke the blockade of French ports by England for the carriage of grain, while the French ships could not reach the eastern Mediterranean. Hydra quickly became rich and powerful and flourished culturally. Decisive role played also the local government that ensured by the Ottoman administration. A group of notables defined the "elders", while head of administration was a Greek, appointed as deputy by the Turks ('bas Kotzabasis "). Very important was the time of the administration by George Voulgaris, who was appointed governor in 1802. Even a nautical institution was established, in which Italians and Portuguese teachers were asked to teach, while rules for the regulation of shipping and trading adopted. 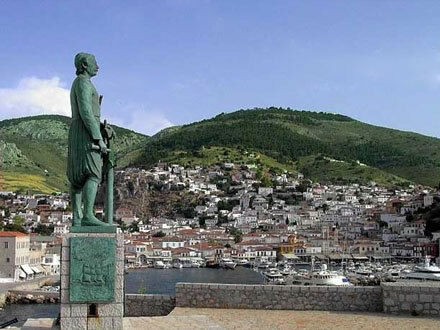 On the eve of the Greek War of Independence in 1821, Hydra had 28,000 inhabitants and a fleet of 186 ships with a total tonnage of 127,000 tons, manned with experienced crews in the battle and equipped with cannons on the risk of pirates. The revolution was declared in Hydra on April 16, 1821 by Anthonios Economou and the people despite the hesitations of notables. The island contributed decisively in the naval battles of Greeks and offered great leaders and fighters like A. Miaoulis, A. Pipinos, I. and M. Tombazis, A. Tsamados, G. Saxinis, G. Saxtourhs and many others. Hydra sacrificed in the revolution lives, ships and money. The liberation found it without fleet and without wealth. But it continued to give to the Greek state politicians and great leaders. One of them was the admiral of the Balkan Wars and president of the first Greek Republic in the 1920s P. Koundouriotis. In the 20th century the residents worked in fishing and sponge diving. The sponge fishing gradually declined and the economic downturn brought depopulation. 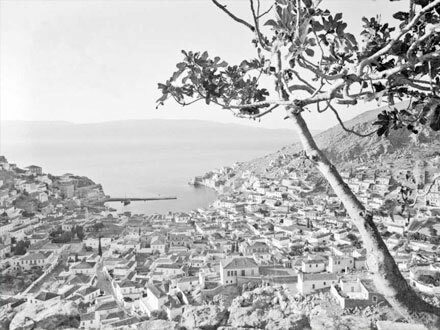 But by the 1950s, Hydra was discovered by artists and film producers and developed into one of the major international cosmopolitan tourist centers. As the ship enters the port, the traveler understands immediately why Hydra is considered as one of the most beautiful island towns. A bay well protected from Nature, tied yachts, caiques and boats and the colorful waterfront upwards the city Amphitheatrically spread with the houses close to each other! Unique landscape! The town of Hydra is located in the middle of the north coast. It has been declared a preserved traditional settlement. It began to be created in the mid 17th century. In 1641 the monastery of Kimissis of Theotokou (the Assumption) was founded. The inhabitants of the first settlement, Kiafa, which was higher up, settled around the monastery. Its buildings, in the middle of the waterfront, now house the Town Hall and the Ecclesiastical Museum. 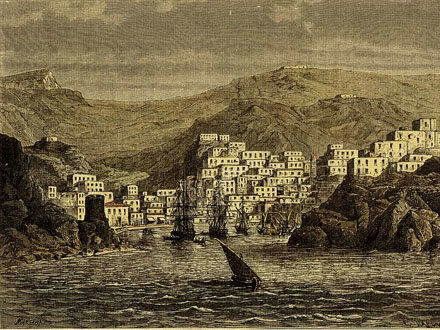 Hydra began to take its present form in the late 18th and early 19th century at the time of its great prosperity. It is considered and it is one of the most important architectural settlements in Greece. The walk to the seaside, the ramparts at the harbor entrance, and the narrow uphill streets is a unique experience and a real delight. The magnificent mansions remind the glorious maritime past. Built of stone with three or four floors and tiled roof. Their facades flat, bright colors, no added features, but with openings symmetrically distributed; inside the rooms large and comfortable and the wooden ceilings decorated. Some of the most known mansions are of Koundouriotis, Miaoulis, Vulgaris, and Voudouris. Known are also the mansion of Tombazis where is an annex of Athens School of Fine Arts, of Kriezis which houses the retirement home and of Tsamados which houses the School of Captains of Merchant Navy. The folk houses are simple, also with bright colors in the facades and windows. The flower-filled courtyards are enclosed by high walls with bougainvilleas and jasmines. Structuring is continuous. The houses climb up next to each other and in the narrow cobbled streets arches are distinguished, which were closed for safety. Everything indicates that the settlement had a defensive character, like all Island settlements for fear of pirates. Reaching high up, we look on the city going down around the charming harbor. Images that remain in memory! 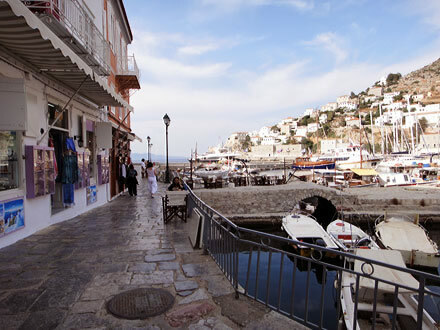 Hydra is a cosmopolitan tourist destination, but it is always Hydra of the great maritime tradition. Unchanged! Beautiful! We can learn more about the history and tradition at the Historic Archive and Museum where there are manuscripts, documents and codes of the 18th and 19th century, weapons of Hydrans fighters and ship figureheads of the War of 1821, relics of the wars of the 20th century, historical gallery with works of great painters and library. 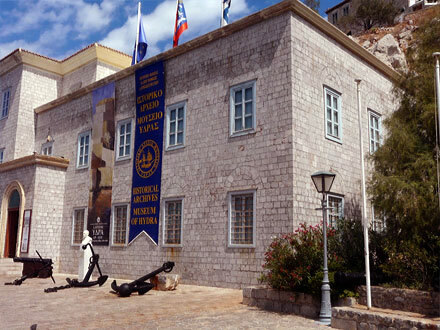 We can also visit the Ecclesiastical Museum, the Museum of the Family Koundouriotis and the Art Gallery and Concert hall "Melina Mercouri", which hosts the works of famous artists throughout the year. Of particular interest are the churches of Ypapantis (the Visitation) and of Aghios Ioannis Nisteftis, and the monasteries of Prophet Elias and Aghia Eupraxia, built on a hill above the town. There is also the monastery of Aghia Fotini. The other four monasteries of the island – of Aghia Triada, of Aghia Matrona, of Aghios Nicholaos and of Virgin Mary of Zourva – are in the interior, destinations of nice hiking paths. 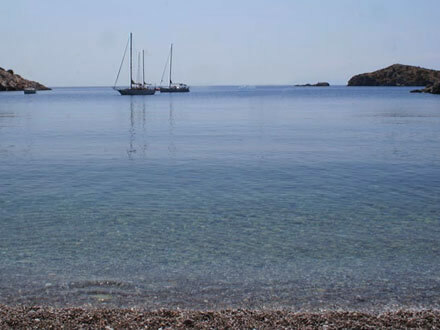 Hydra has several beaches with sand and pebbles but also rocky points of the coast suitable for swimming. We can go depending on distance on foot, donkey or by boat from the port. In the town of Hydra, out of the harbor, are Spelia (Cave) and Hydroneta, rocky beaches with deep waters that attract many swimmers. East of the town is the beautiful bay of Mandraki, where the hotel Mira Mare with an organized beach with sand and pebbles. We go by boat or on foot. On the south coast, in the eastern part of the island, in a bay is the beach of Limnioniza where we go by boat. West of the town at a short distance is the beach of Avlaki with pebbles, the small beach of Kamini with taverns and the organized beach of Vlychos where are also taverns. On the other beaches of this side we go by boat. At a greater distance is Palamidas with sand, Molos in a small cove surrounded by cliffs with the islet Kivotos opposite, and Kaoumithi with sand. On the southwestern tip of the island is the organized beach of Bisti with pebble, near the homonymous cape, in a small bay surrounded by pine trees, seeing across the islet Petassi. On the other side of the southwestern edge is the organized beach of Agios Nikolaos in a bay with the islet Tsigri in front of it. The surrounding hillsides are full of pines. 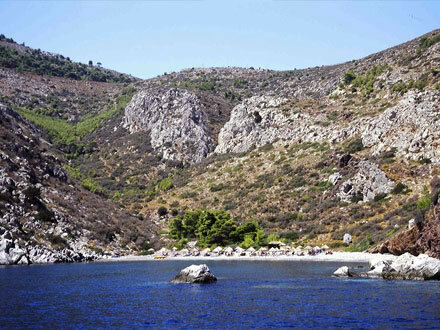 To the east, in the south coast is the beach of Nisiza with pebble in a small cove near the settlement of Episkopi. 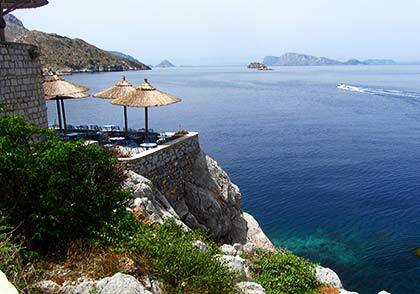 From the town of Hydra begin beautiful hiking trails leading to the coast and the inland. In the paths are signs which lead us locating sights. A path leads to the eastern part. From Hydra we follow the road of the coast and in less than twenty minutes we arrive at Kastraki, a small coastal fortress built in the late 17th century. In ten minutes is the bay of Mandraki. 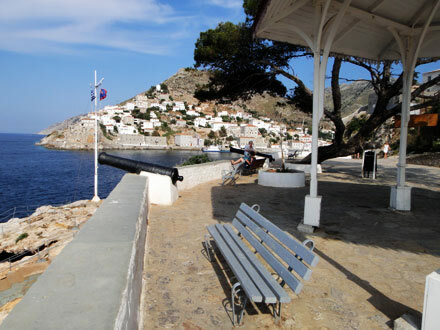 It was the naval dockyard of Hydra and the main port of the 16th to the 18th century. Today at the cove is the Mira Mare hotel in a nice old mansion with organized beach. Fifteen more minutes and we arrive at the Castle, fortification of the early 16th century. We continue inwards and in fifteen to twenty minutes we reach the convent of Aghios Nickolaos in nice scenery. From here a fairly difficult path leads to the east side of Hydra. We Pass near ruined stone buildings, houses of shepherds before, continue at the foot of the hill Ombori with its top at a height of 506 m and seeing in our the way renovated 18th century chapels we arrive after nearly two hours in the monastery of Panagia of Zourva. Another trail leads to the inland monasteries towards the south coast. From the monastery of Agia Fotini we take the path that reaches a stone mill of the 18th century. From here a path leads to the monastery of Aghia Matrona and another to the monastery of Aghia Triada (the Holy Trinity), from where we can go to the monastery of Aghios Nicholaos. The distance to Agia Matrona is forty minutes and from there fifteen minutes to the Holy Trinity. In this area we can continue south. We pass near the bay of Limnioniza and the area o Klisamprinia and taking a narrower path we reach the Hounda of Rigas – the cape of Rigas – from where we stare at Myrtoon Sea. Another trail starts from the church of Aghios Constantinos. We go through a pine forest and the area of the Old Nun's, where there was a nunnery, and forty-five minutes later we arrive at the monastery of Prophet Elias, which during the revolution of 1821 was used as a prison. In the courtyard is a cistern of drinking water. The highest hill on the island, Eros, at 588 m, is fifteen minutes away, but this part of the path is difficult. But the breathtaking view compensates the effort. From the top, we see the whole island and the surrounding sea. From the same point of the town begins a path to the southwest. It is difficult, but it leads to one of the most beautiful areas on the hill Eros. After walking for an hour we arrive at the white chapel of Aghios Mamas. From here take the path to the east and in half an hour we are in Klimaki near the south coast where there are cottages and beaches. Very nice is also the path that leads to the western part of Hydra. From the town we take the coastal road and arrive first at the small settlement of Kamini with taverns, a natural harbor and a beautiful pebble beach. We continue to the coastal path and twenty-five minutes later we reach the settlement of Vlychos with an organized beach and taverns. We pass a nice bridge of the 17th century and after twenty minutes we are in Palamidas, where is the mansion of Vulgaris. Near to the sandy beach is a small shipyard for repair and maintenance of boats. From Palamidas we take the harder path south, inwards, we stop to enjoy the view from the chapel of Aghia Marina and in half an hour we reach Episkopi with traditional houses and olive groves. Here we have two options; one to the west and one to the east. To the west we pass the hill Barbari and in about half an hour we reach the settlement of Zogeri with nice cottages. The view is excellent. From here we can descend to the beautiful beach of Aghios Nikolaos. East of Episkopi the path is more difficult, but after thirty minutes leads to Nisiza, another nice beach on the south coast. 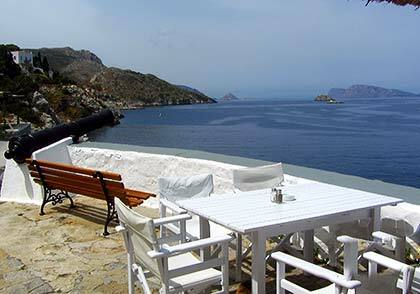 Hydra is one of the favorite islands of writers and artists, especially painters. There are many cultural events and year-round art exhibitions and musical meetings. 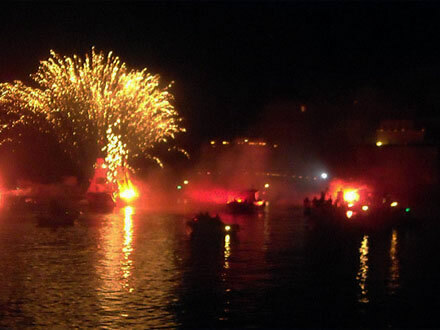 Hydra celebrates Easter with its own traditional way. Good Friday in Kaminia takes place the procession of the Epitaph in the sea and on Easter Sunday Judas is burned. At the end of June the Miaoulia are held, three-day events dedicated to Admiral of the Revolution of 1821 Andreas Maioulis, integrated in the annual celebration of the Naval Week in Greece. Include boat races, swimming races, traditional dances and other events. In July takes place the International Puppet Festival. It is also worth to attend traditional celebrations and festivals. Among others, on June 24 is the feast in celebration of eight patron Saints of the island and on 15 August the festival in celebration of the Virgin Mary.